As we now enter 2018, what method of transport should you choose when making the arduous journey from Yangon to Bagan? Plane, train, or automobile? Which is the best option for your wallet? Which is the best option for your backside? And which is the best option for your safety? Once the capital of Myanmar, Yangon is a thriving and somewhat chaotic place, where your assumptions of a sleepy tropical city in the same vein as Luang Prabang or Chiang Mai are thrown out of the window by the sight of the frenetic pace of local life – both on the roads and on the paths! Bagan, in contrast, is a sleepy, timeless area that still possess some old world charm. Everything you hoped you would see and do in Yangon (and were wrong) can actually be experienced pretty easily here. Most people will want to come to Bagan to see its famous temples (admission is around US$20 per person, as of October, 2017). The huge and sprawling Bagan Archeological Complex was once a UNESCO World Heritage Site, although this status was revoked because of the Myanmar authorities were not preserving the site as well as they should have been. Although these temples are famous, they are not anywhere near as famous as those in Cambodia at Angkor, or even as popular as some of the Thai temples in Bangkok and Chiang Mai. Yet this is part of the charm of Bagan. In August, 2016, there was a significant 6.8 magnitude earthquake that destroyed many of the temples within the complex. Yet while the damage is obvious, the journey to Bagan remains unhindered, and the relative lack of tourists here provide a welcome respite from the usual crowds found in the more conventional travel destinations nearby. Once you find a good hotel in Bagan, just plan your itinerary for the temple-trampling. But once you have obtained your Myanmar visa in advance (at the time of writing, Visa on Arrival to Myanmar is not available for travellers of any nationality), and once you have landed at one of the two international airports in the country (at Yangon or Mandalay), then you will probably need to find a way of getting to Bagan in the very centre of the country. So do you take the bus, the train, or the plane? No crashes this year. Yet. Flying from Yangon to Bagan will cost you around £120-£200 return per person. This is very steep, and the Myanmar tour companies and airlines know this. But they won’t ever lower the prices substantially. Air Bagan is probably the best airline flying the route, but you can also choose from Myanmar Airways, and Air Mandalay. Air travel in Myanmar is not the safest, and there are usually a few fatal crashes every year. I did not take the plane journey, despite being a fan of aviation, as these poor safety records concerned me. However, many people do use domestic airlines in Myanmar, and this overview from The Points Guy gives you a little taster of what to expect (although I guess it varies from airline to airline). From Bagan’s Nyaung-U Airport, check to see if your hostel or hotel will pick you up. Sometimes, this perk is built in to your accommodation price, so there’s no harm in asking! Standard class for 17-18 hours? Overnight trains depart from Yangon Train Station at 4pm each afternoon. You will arrive in Bagan not before 10am the following morning. This is the method of travel I took after a lot of research on the trains over at SEAT 61. The overall travel time for me personally was actually around 17 hours, and we arrived earlier than expected. I paid 16,000 Kyat (around £30) for an “upper class” sleeper cabin, and I would recommend this extra splurge – even if the trains can be pretty rickety, as well as being very noisy and hot! If you must travel as cheaply as possible, then upper class seats are available for 12,000 Kyat, whereas for true backpackers there are second class seats for around 4,000 Kyat (as of February, 2016). However, second class will not be a particularly enjoyable journey! Food and drink is served throughout the journey, although it is not built in to your ticket price, regardless of class of carriage, so you do have to pay extra for it. A comprehensive and somewhat positive write-up of the train journey from Yangon to Bagan can be found in this article here written by Dan at This World Rocks. A negative perspective of this arduous train journey is provided here by Vanessa at Turnip Seed Travel. I believe a train journey is not usually as bad as that. Vanessa perhaps just picked a wrong day to travel, but interesting nonetheless! VIP Bus. Not bad. Not bad at all. If I had known at the time that bus journeys between Yangon and Bagan take nearly half the time it takes on the train, then I may have booked the bus instead. Leaving from downtown Yangon, these express buses depart at around 6pm each evening, yet seem to arrive in Bagan in the middle of the night at around 4am. If you have pre-booked a hostel, then I guess this is fine. Otherwise, you may have to stand around with the cows and the cockerels for a few hours until a more sociable hour! These buses are very loud, as there is Burmese music and dubbed movies playing on the TV until midnight, at which time thankfully someone pulls the plug so the travellers can all get some kip! The price of this bus trip is 15,000 Kyat. There is also a VIP Express Bus service plying the same route which is priced at a seemingly reasonable 18,000 Kyat, so it may be wise to look into that one, especially if the quality of the bus appears safer. Buses are slightly more expensive than trains on the journey, but the difference is negligible really. If anything, buses are better value for money as they provide a more comfortable journey. I can highlight two recent reviews of the bus company Joyous Journeys from Globe Dreaming and Through Arden’s Eyes. Their experiences of this overnight bus from Yangon to Bagan should give you a good idea of what to expect if you choose this method of transport. The boat trip down the Irrawaddy takes AGES! One final thing: this article presumes you will be making your way to Bagan from Yangon, as Yangon was, for the longest time, the only international gateway to Myanmar (land borders are closed everywhere). Now, though, some budget airlines such as Air Asia from Kuala Lumpur, and Silkair from Singapore, fly directly to Mandalay, which is much closer to Bagan. Getting to Bagan from Mandalay is easy. The Irrawaddy River links the two cities, and for a true taste of Burmese days from yesteryear, you could make the journey by boat, which while taking at least 8-9 hours, will still give you some pretty nice scenery to enjoy while still allowing you to take in that fresh air (must be better than a bus or train with no aircon!). And when you finally do make it Bagan, simply enjoy the laid-back lifestyle and try to live like a local! The August 2016 earthquake damage will take a long time to clean up (years, unfortunately) but I still recommend visiting, just to experience the ambience of the place. If you’re a solo traveller like me, why not rent a bike to explore the pagodas, or if you’re a romantic couple then why not hire a horse-drawn carriage to experience the sights of the plains? And most importantly of all – don’t disturb the monks! Page last updated January 31, 2018. Please report any dead links. Fyi. Not all nationalities, south east asian nationals are exempted with visa. Any idea what time is the bus back from Bagan to Yangon? I’m all pumped up for my visit to Myanmar next week thanks to you and your amazing blog. I will be traveling from Yangon to Bagan, then Mandalay & Inle before returning to Yangon (from Inle) to catch flight back to Kuala Lumpur. I’ve booked JJExpress from Yangon-Bagan & Bagan-Mandalay. 1 question though. It seems JJExpress does not provide bus to Nyaungshwe which is the town closest to Inle Lake and instead travels to Taunggyi which is about 30km form Inle. No Nyaungshwe option in JJExpress website. However some other website such as oway.com does provide ticket booking for buses that travel to Nyaungshwe including JJEpxress. So I’m a bit confused here. Do you have any idea whether oway.com is trustable or not? Or could you suggest an alternative of VIP buses that travel from Mandalay-Inle-Yangon? Thanks in advance. Hi Faizal, I am glad my blog has helped you a little bit! Regarding the bus to Inle Lake area, I am not aware of reliable buses that visit there (apart from local ones). Buses take around 7 hours to make the journey. My advice would be to catch the train from Mandalay to Inle Lake region. 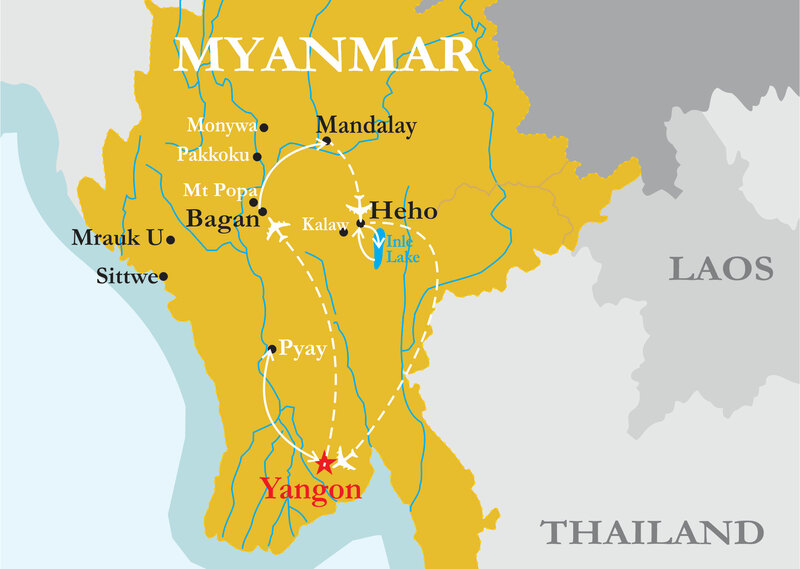 However, according to the great site at Seat61 (https://www.seat61.com/Burma.htm#Yangon or Mandalay to Inle Lake) it will require an overnight stop in Thazi before heading onwards to Inle Lake. Thank you so much for your prompt reply. Really appreciate it. Keep writing & inspiring . Cheers! Btw. The Ruby white link (traveling by bus) no longer works. I will be travelling ALONE to Southeast asian countries in July.. Initially Mynmar is not included on the countries I’d like to visit but after reading this blog, it makes me think otherwise. Hi Danica, I really hope you can visit Myanmar soon. It is a great country to explore, with many different areas each with its own distinct personality… what other SE Asian countries are you planning to visit anyway? Thanks for the useful tips, especially the train info! Going to in Myanmar next month. So stoked! Great and informative article. I think I’ll take the bus instead of the plane. Keep up the good work! If you want to find all information about Myanmar Bus including departure and arrival time.